It is Easter Saturday, 30th March 2013 and if you have popped over to the Mischievous Website blog, you will have noticed that I haven’t written anything since January. It is the usual story: Man starts project; Man gets involved in other projects; other projects take over from first project; Man tries to juggle all projects; Man needs money to keep all projects in air at same time; Man works on a completely different project to earn money to support the first projects; Man closes eyes, runs and hopes he can return before all projects crash to the floor and roll under the sofa; sofa so good; Man returns and catches projects by skin of his teeth (not easy); Man happy now … though tired and slightly irritable. Man must pull out finger! Welcome … thank goodness we’ve cleared that up! Over the last year or so Mischievous Theatre CIC has been working on a project called The Man in the Wide-Awake Hat; this is a theatrical event based on the life of AWN Pugin. In the early days of this project it was called a play but as the time has, as is its wont, raced ever onward, and I have discovered more and more about this amazing man, the play has become a theatrical event. Why? AWN Pugin was a polymath; he created designs for buildings, stained-glass, wallpaper and myriad other things; he changed the way people thought about design and architecture; his life was full, he was widowed twice, shipwrecked, went mad and died at the early age of forty and yet in that short space of time, he changed the face of Britain. As a character he was always on the move, both physically and mentally … “the impression he left me with was as of a fire engine on its way to an inferno …” John Hardman-Powell. To capture this man, his mind and his legacy, I had to find a whole new approach (for me) towards creating a piece of theatre that would engage, provoke and intrigue an audience: it seemed somehow bigger than a play, so I’ve called it a theatrical event because I can’t think of anything better … at the moment … WATCH THIS SPACE! 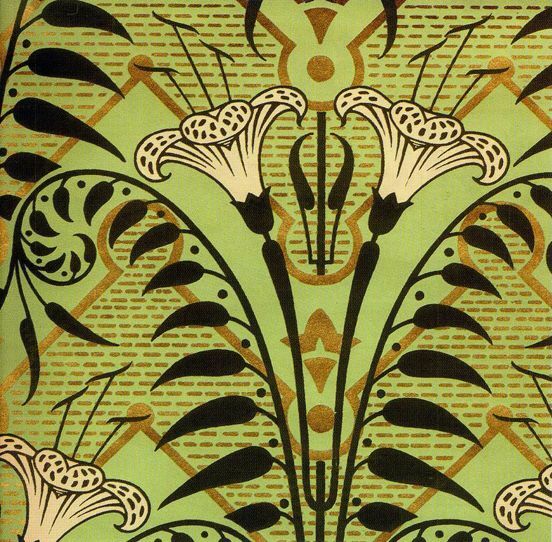 Ever since I first started thinking about this project I knew that the life of a Victorian architect and designer, a person that many people have never heard of, was always going to be a hard sell. How could I possibly think that a play about a man whose life is seemingly, so far removed from our lives today, going to entice an audience into a theatre! Always, from the beginning of the project, the play was going to be performed in various Pugin buildings around the country, and not in a theatre per se but even so, what could I do to persuade people to come and see a play in a church. I tussled with this for months. Last year I ran workshops, did talks, performed a ten minute scene, wrote in various magazines and at every turn I met people who had never heard of him or who couldn’t work out why they should be bothered with him anyway, what has he done that is so noteworthy for us today; why should I be interested in this man? I have had my doubts too; what did he do that should be celebrated or even remembered, what can we learn from him and his experiences! These are some of those questions that always come to mind when you are creating a new piece of theatre: why are we doing it, is it a worthwhile thing to do, what’s the point and who are we doing it for? I didn’t have to think about some of those at all; we are doing it because humans haven’t really changed. Yes, the world has changed around us; we have a lot more technology and our lives are much easier than for most people 200 years ago but as humans we haven’t really changed … we still love, fear, hope, dream, we still have to work, we still have to raise our families, find a roof to go over our head; and anything that helps us to understand the world that we are living in is a worthwhile thing to do. AWN Pugin suffered more than most, losing two wives, being ill for much of his life, and yet he survived, he threw himself into his work, he created beauty when he could easily have become a miserable old curmudgeon. His life story is inspiring; his determination, his sheer energy and commitment, his eye for beauty, a feeling of fairness, he was a charitable man, (there is a story of him giving his boots to a bootless man, amongst many others) he was a man who was not frightened of change and it is for these reasons that I believe the event has to be performed. 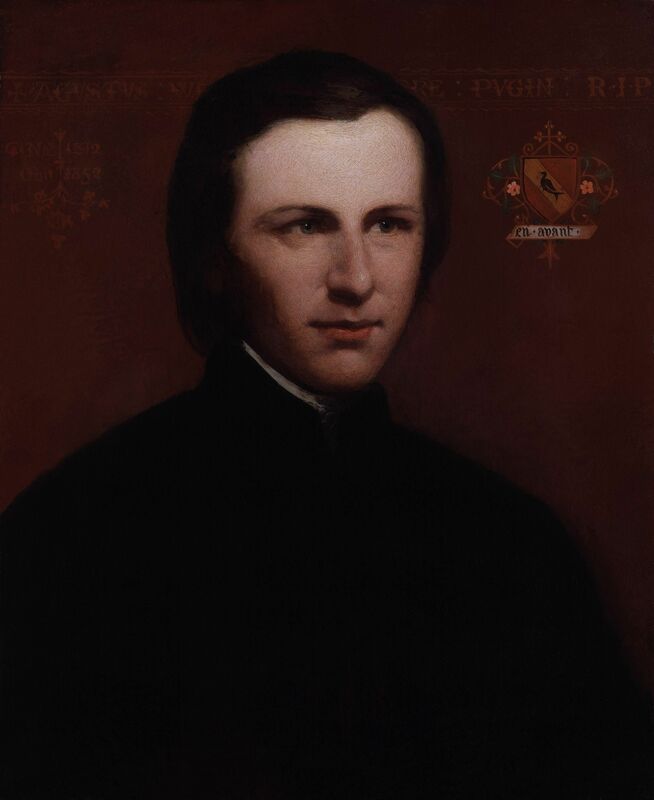 Pugin, born in 1812, had one foot in the Georgian era and one in the Victorian … he was alive during a period of huge change; the country moved from primarily a rural economy to an urban economy, thousands of people moved from the countryside to the booming towns and cities, from working on the land to working in manufactories, the population grew, the financial world changed too; there was a growing middle class and a great deal of “new” money as factory owners, their suppliers, merchants and exporters took advantage of the expanding empire, the “old money” (the landowning classes) were still the ruling class and were highly represented in parliament but the owners of the wealth was this new class of manufacturers and industrialists who were not represented in parliament. The financial, political and social systems and institutions that had been in place for centuries became, quite suddenly, out of date. The Corn Laws are a good example of this. The corn laws, which levied a high import duty on grain to protect the British landowner, kept the price of bread, the staple diet of most working people, high, to maximise the profits for the landowners; the new industrialists wanted the corn laws scrapped, as it was affecting their profits (they had to pay workers higher wages than they wanted to, in order that the workers could buy that bread) and, in the middle, was the worker, who was being battered by both parties. The Industrialists felt that the high price of bread was affecting their ability to make big profits; they wanted to move to a system of Free Trade. The Landowners wanted to protect their profits and so did not want free trade and the workers wanted, generally, their lives to be better. Right in the middle of all this were … the Tolpuddle Martyrs … a group of Dorset Farm Labourers who formed a Trade Union (though they were convicted of “taking a secret oath” … a throwback to the medieval ages if ever there was one) in order to keep their 6 shillings (30p) wages per week. 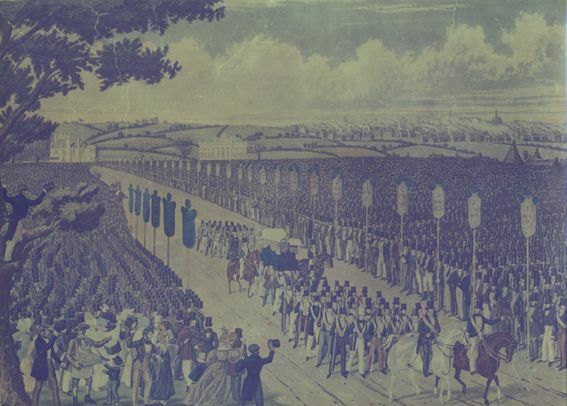 The Landowners, and therefore the Ruling Class, were still very worried about the French Revolution which had occurred just a short while before, and so wanted harsh sentences for anyone of the peasant class who balked against cuts in their wages and so, the Tolpuddle Martyrs were sentenced to seven years transportation. As soon as their sentences were known, the working classes, fronted by the Trade Unions, held a mass demonstration, the Government, frightened by the size of the protest, ordered the Lifeguards, the Household Cavalry, detachments of Lancers, two troops of Dragoons, eight battalions of infantry and 29 pieces of ordnance to be mustered. A petition of over 800,000 signatures was presented to the government … the Home Secretary, Lord Melbourne, hid behind the curtains and refused to accept the petition. Eventually, after three years, the Tolpuddle Martyrs were given a full pardon and allowed home. The Corn Laws were repealed in 1846, thirty-one years after being introduced. At the same time as the Tolpuddle Martyrs were being transported for “taking a secret oath”, the age of steam was gathering momentum, huge manufactories were being created, the towns and cities were bursting at the seams, slums were being thrown up for the workers with no planning regulations to speak of, the Empire was growing … almost everyone and everything in Britain was going through a massive change: this is the backdrop to AWN Pugin’s life. 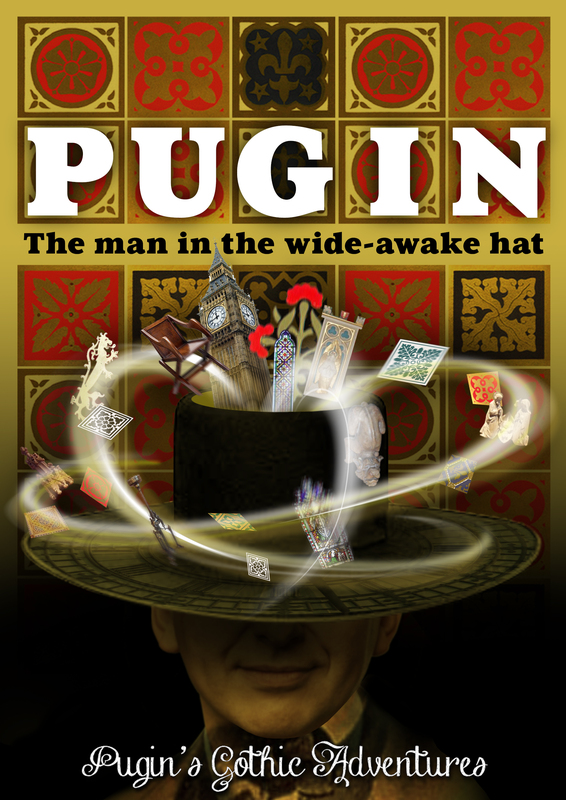 It is these enormous changes and how they affected the people of the country, politically, economically and emotionally, and how Pugin saw and dealt with these changes in his own life, that makes “The Man in the Wide-Awake Hat” a theatrical event rather than a play, and why it is relevant for a modern audience. Please come back and see the next episode of “AWN Pugin has Eaten My Brain” soon. I will post as often as I can over the next few weeks. See you again. Home … this will take you home. Red Sky at Night, Shepherds Pie … this will take you all the way there. The Wide Awake Hat … this will take you to a place where hats must be worn. This entry was posted in The Blog on November 13, 2012 by clive498.